A spa break in Northamptonshire would bring you to the very heart of England and offers two great venues, both from two of our most popular hotel chains. The first is the Daventry Court which is part of The Hotel Collection and the second the Hellidon Lakes, part of the award winning QHotels group. Both venues offering great accommodation, super food and relaxing spa facilities. Northamptonshire is an easy county to find your way around, it offers excellent rail and road links to all of the counties great tourist attractions. The area offers so many lovely villages, each with small country lanes, beautiful houses, cottages and churches. If you’re into motor sport and lucky enough to be in the area on the first weekend in July why not visit Silverstone Race Track for the British Formula One Grand Prix. If relaxing and peacefulness are terms that describe why you a taking a spa break in Northamptonshire, then stretch your legs in the many miles of walks around the woodlands, canals and pretty country parks. A Walk to the Rockingham Castle would be well worth a trip out, located on a hill top it offers undisturbed panoramic views of the county. Set in the heart of the English Shires and within easy reach of some of the most beautiful countryside and stately homes in England, the Holiday Inn Corby-Kettering hotel is the perfect place for a relaxing getaway. Comprising well equipped standard rooms, spacious executive rooms, accessible rooms & indulgent suites, the Holiday Inn Corby-Kettering hotel offers something for all budgets. . .
Set in peaceful surroundings, Hellidon Lakes is a four-star hotel with great leisure facilities, making it the perfect place to chill out on a midweek or weekend break in the Northampton area. Situated in 220 acres of rolling countryside it offers splendid views overlooking the lakes and local area. 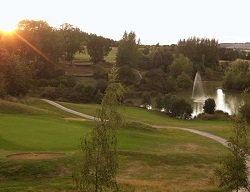 The hotel also has its own Championship golf course (please enquire. . .